A team from Warwick and FERA (York) have just published a paper on the spread of American foulbrood, an extremely virulent disease affecting honeybees, on the island of Jersey. This is the first paper from this team, which is funded by the Insect Pollinator Initiative. The work is published in Journal of the Royal Society Interface . We investigate the spread of American foulbrood (AFB), a disease caused by the bacterium Paenibacillus larvae, that affects bees and can be extremely damaging to beehives. 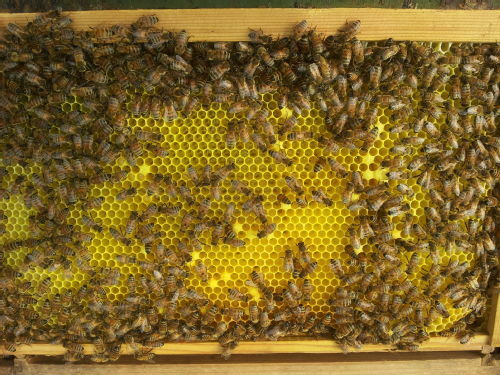 Our dataset comes from an inspection period carried out during an AFB epidemic of honeybee colonies on the island of Jersey during the summer of 2010. The data include the number of hives of honeybees, location and owner of honeybee apiaries across the island. We use a spatial SIR model with an underlying owner network to simulate the epidemic and characterize the epidemic using a Markov chain Monte Carlo (MCMC) scheme to determine model parameters and infection times (including undetected ‘occult’ infections). Likely methods of infection spread can be inferred from the analysis, with both distance- and owner-based transmissions being found to contribute to the spread of AFB. The results of the MCMC are corroborated by simulating the epidemic using a stochastic SIR model, resulting in aggregate levels of infection that are comparable to the data. We use this stochastic SIR model to simulate the impact of different control strategies on controlling the epidemic. It is found that earlier inspections result in smaller epidemics and a higher likelihood of AFB extinction. Contact Samik Datta for more information.